"It's still making us laugh, days later." 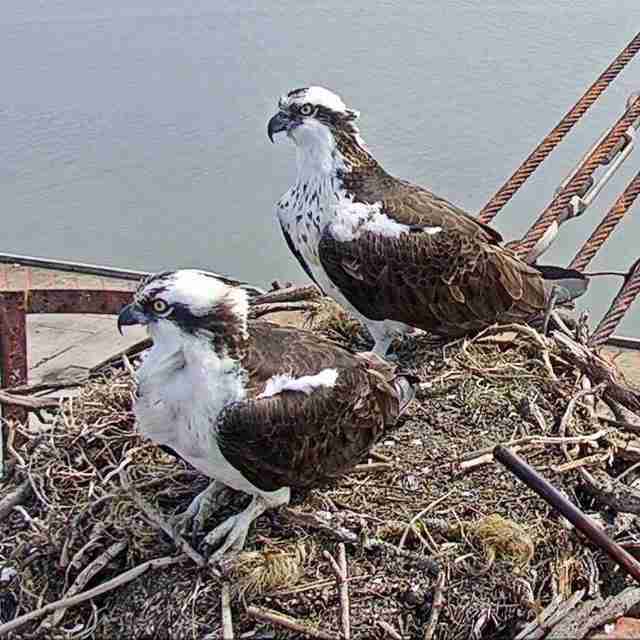 Richie and Rosie are a pair of ospreys living in the Bay Area of California. 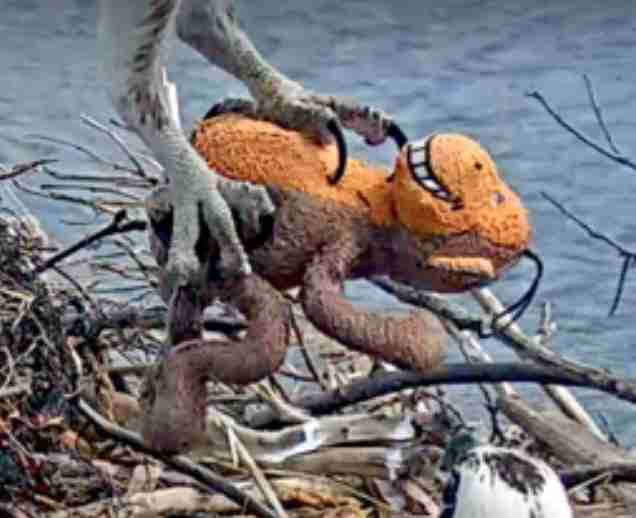 For the last few years, their day-to-day life has been on display for the world to see, thanks to a webcam placed near their nest as part of a project from Golden Gate Audubon. The up-close footage has revealed much about this bird of prey’s natural behavior — and a few surprises. As it so happens, Richie and Rosie are currently caring for three eggs. To ensure their unhatched offspring remain properly incubated, the parents-to-be have been working together: While Rosie stays with the eggs, Richie heads off to track down a meal to share between them. 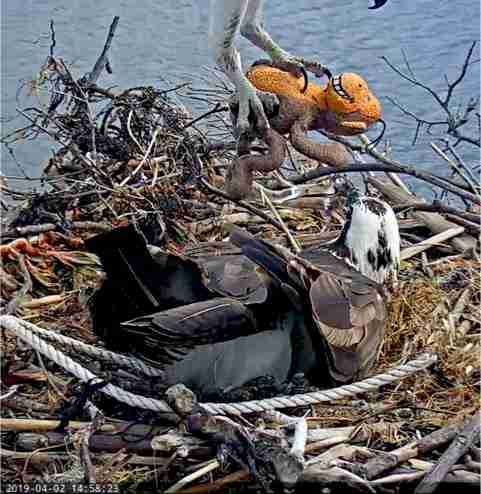 Being a skilled hunter, he typically returns to the nest with a tasty fish for Rosie. But on one recent mission, he apparently decided to surprise her with a different sort of catch. On this day, Richie returned home to the nest with a toy — a stuffed, orange monkey doll, to be exact. Was Rosie charmed by the gesture? It's hard to tell. But Cindy Margulis, executive director of Golden Gate Audubon, certainly was. "The monkey made us laugh. It's still making us laugh, days later," she told The Dodo. "One of the joys of watching wildlife is the surprises they provide for us." Even the plush monkey himself seemed rather pleased. It's been about week now since the monkey arrived, and at last check he was still there, nudged to the edge of the nest muddy-side up. This isn't the first time Richie has returned home with a man-made object — though, on a whole, that's actually not a good thing. "In the case of the toy monkey, it's amusing. But most times it's not so amusing," Margulis said. 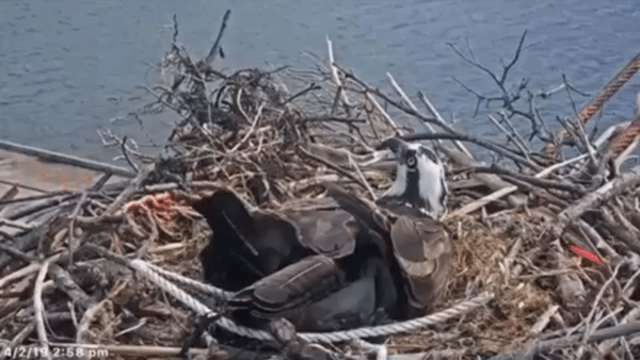 "[We've seen] lots of plastic items, and items that represent an entanglement hazard for ospreys or a suffocation hazard even for their eggs. 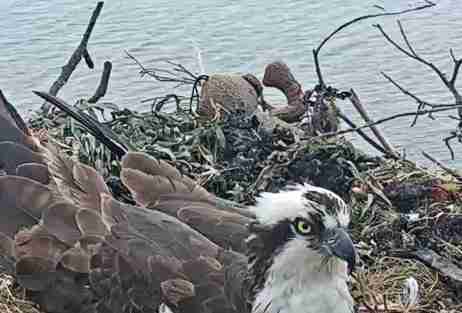 Most of the man-made objects ospreys collect aren't very funny at all." Margulis hopes this will serve as a reminder for folks to be more mindful not to litter, as doing so can pose a real danger to wildlife — an important lesson indeed, provided by none other than a grinning orange monkey.